SANTIAGO, Jan. 22 (Xinhua) -- China and the Community of Latin American and Caribbean States (CELAC) are committed to building an open world economy to promote economic globalization and have opened up new areas of cooperation such as a joint battle against drugs, corruption and cyber-crimes, Chinese Foreign Minister Wang Yi said Monday. 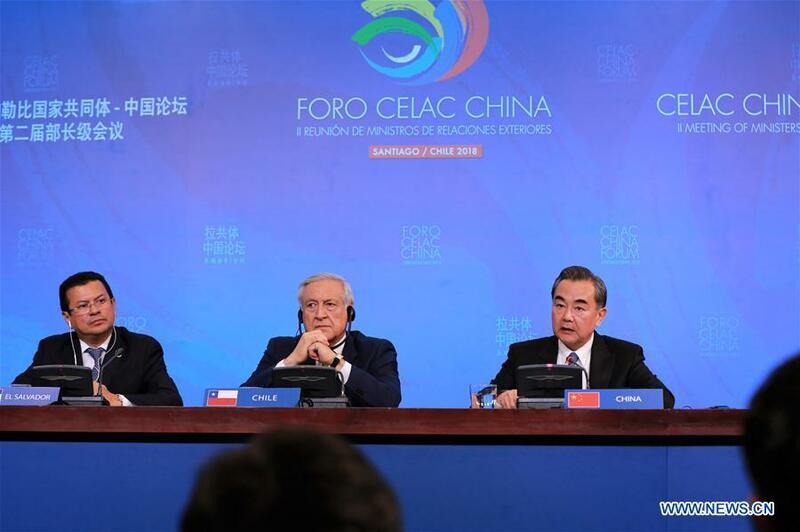 "We will work together to advance (the) China-CELAC comprehensive cooperative partnership to a new level," Wang told the press after the second ministerial meeting of the China-CELAC Forum in Santiago, Chile. Both China and the CELAC follow multilateralism, uphold the free trade mechanism, and are committed to building an open world economy to promote economic globalization in an inclusive, balanced and win-win direction, Wang said. Wang also said new areas of cooperation have been opened up. They include addressing corruption, drugs, and cyber crimes. The meeting made a special announcement on the China-proposed Belt and Road Initiative. CELAC members unanimously said the vision to enhance infrastructure, trade and people-to-people ties worldwide has provided their countries with ample development opportunities, and hoped to join it to achieve common development with China. Both sides agreed that the joint construction of the Belt and Road Initiative will inject new energy into the China-CELAC comprehensive cooperative partnership and open up new prospects. Both sides also said they are willing to promote cooperation under the "1+3+6" framework. In July 2014, Xi laid out the "1+3+6" cooperation framework in his keynote speech at a China-Latin American and the Caribbean (LAC) summit held in Brasilia, Brazil. The "1" refers to the China-LAC Countries Cooperation Plan 2015-2019 to guide specific cooperation projects. The "3" identifies three driving forces for cooperation, namely trade, investment and finance. The "6" prioritizes six fields of cooperation: energy and resources; infrastructure construction; agriculture; manufacturing; scientific and technological innovation; and information technology. Wang suggested that China and LAC should jointly build "grand connectivity" on both the sea and land. "Grand markets" that are open and reciprocal and "grand industries" featuring advanced and independent technologies should be developed. The foreign minister also advocated seizing the "grand opportunity" for innovation growth following green and sustainable development, and launching a "grand communication" based on equality and mutual trust. The meeting also formulated measures in key cooperation areas such as politics and security, financial and trade investment, infrastructure and transportation.